Two of our varieties specially selected for Spring planting. These are varieties which for us over the years have proved to grow equally well with both Autumn and Spring planting. We have sometimes found that Spring planting with these types can lead to a rounder more symmetrical bulb than those that have over wintered. Picardy Wight x 1 bulb: Allium Sativum (Softneck) - Originating in the fields of Picardy, growing on the battlefields of the Somme and the surrounding area. Adapted to cooler and wetter conditions, will grow anywhere in the UK that has proved a challenge to other garlic. Mersley Wight x 2 bulb: Allium Sativum (Softneck) - Mersley Wight originates from the Auvergne in Central France across to the volcanic Drome in northern Provence. Solent Wight x 1 bulb: Allium Sativum (Softneck) - Versatile Autumn or Spring planting with harvest in mid to late July. The basics: Plant your garlic in an area which will receive maximum sunlight hours. Place the cloves 3 – 4cm below the surface, root down (pointy end up) 6 inches apart. Water your garlic during dry periods, stopping watering completely during the last few weeks. Harvest when the lower leaves start to yellow and fold. Mid May – mid August depending on variety and location. 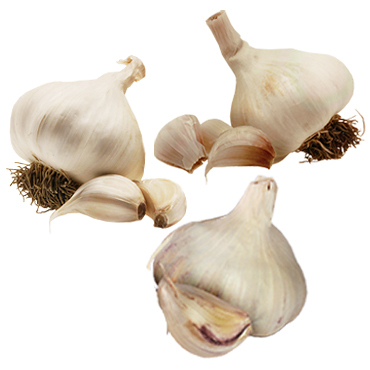 Click here for our detailed garlic growing instructions and our month by month garlic grower’s guide.